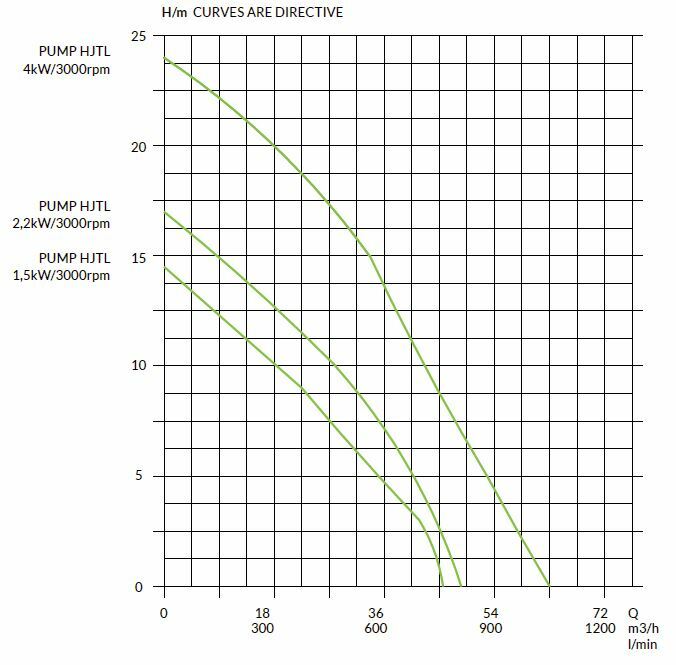 HJTL pumps are suitable as special pumps for difficult conditions. There are no bearings nor sealings below the mounting plate. All parts that are in contact with fluid are of acid-resistant steel (SS 2342), Aisi 316), and the surface is pickled. The motor stand / bearing housing (HJTL-71 … 73) is made of surface-treated steel. Surface treatment, blasting, iron phosphatizing and polyester powder coating (SFS 5225 SP 40/1 -Fe Sa2½, turkey tone RAL 5003. The HJTL pump can also be made on order also of special acid-resistant steel (904L, 2RK65). The HJTL pumps are single stage, long shaft semi-submersible pumps. There are no bearings or sealings in the pump volute. The impeller and the shaft are accurately balanced and rotating ”free”. The structure of the collar and impeller eliminates the lateral load. Roller bearings in the bearing housing above the mounting plate (HJTL 71 … 73). As a sealing in the liquid, only the seal support ring. No risk of oil leaking into the pumped product. All HJTL pumps can be equipped with suction pipes, which are installed at our factory under the housing. When using a suction pipe note that the liquid surface should be above the pump volute when pumping starts. Please note that the suction pipe also has decreasing effect on the capacity and head. 2. The bearing housing is always above the liquid surface. When pumping very hot liquids the bearing housing is equipped with water cooling. 4. The pump volute is made of acid-proof or, by order, of special acid-resisting steel. 5. Free rotating special-purpose impeller. Only support bearing. 6. Suction pipe as accessory.